On 18 March, Bahrain Institute for Rights and Democracy’s Advocacy Associate, Amanda Milani, delivered an oral intervention at the 28th Session of the United Nations Human Rights Council in Geneva under Item 5 on human rights in Saudi Arabia. Please continue reading for full remarks or click here to download a PDF. 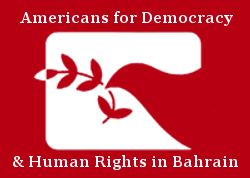 Americans for Democracy & Human Rights in Bahrain would like to highlight our ongoing concern for the extensive cases of human rights violations in the GCC region addressed in the Special Procedures’ Joint Communications Report and the lack of cooperation by these States in engaging these mandates to follow up to these complaints. We are particularly concerned with cases involving Member States of the Human Rights Council, such as the Kingdom of Saudi Arabia. In the latest Joint Communications Report, human rights violations in Saudi Arabia alone addressed at least 37 individual cases and 10 Procedures raised complaints to the Saudi government. This only within its first year as a Member State of this Council. The mandates covered in these communications included Procedures on Arbitrary Detention, Summary Executions, Independence of judges and lawyers, Torture, Human Rights Defenders, and the mandates on the freedoms of religion, expression and peaceful assembly, among others. A number of the abuses enumerated in these complaints are rooted in Saudi Arabia’s failure to thus far implement the recommendations from the visit by the SR on Independence of Judges and Lawyers in 2002, and the last time an SR visited Saudi Arabia was in 2008. Beyond failing to engage the procedures, we are further concerned by Saudi Arabia’s reprisals against human rights defenders for their participation here at the HRC. Following the 27th Session of the Council in September of last year, Saudi Arabia placed a travel ban on Samar Badawi after she participated in side events and delivered interventions here in the Council. Such restrictions and reprisals against civil society are completely unacceptable, particularly by a Member of the Council. We therefore call on all Member States in the Human Rights Council to accept their position on the Council with a responsibility to reach a higher standard in respecting human rights. We further call on Saudi Arabia act on this commitment by lifting restrictions on Saudi human rights defenders and engage constructively with the Special Procedures by immediately facilitating country visits and effectively implementing the recommendations of the Procedures.